Offloading Yellowfin tuna, General Santos, Philippines. The Offshore Fisheries programme at WWF South Pacific is an advocacy, awareness, research and policy input initiative that has been working with our network of WWF offices globally and partners to improve the health and management of tuna fisheries in the Pacific Islands region. Due to the highly migratory nature of tuna in the Pacific, to effectively safeguard their populations from overfishing across their extensive range a highly collaborative approach between Pacific nations, territories and distant water fishing nations (DWFNs) is essential. A large part of Offshore Fisheries' work is advocating changes to national, regional and international legislation to effectively change the way the fishing industry operates. We also operate to improve awareness, Pacific fisheries are often unaware of the growing demand in Europe and North America for sustainably caught fish with certification, and on the other hand Pacific Islanders often have low awareness of the problems associated with offshore fisheries and how they affect their country environmentally, politically and economically. Although the Pacific Ocean is considered to be the last frontier of healthy tuna stocks, it is now facing increased pressure due to the decline of Atlantic and Mediterranean tuna populations and increasing demand from the world burgeoning population. We work to pro-actively promote sustainable tuna fisheries management to protect Pacific stocks from the same outcome. 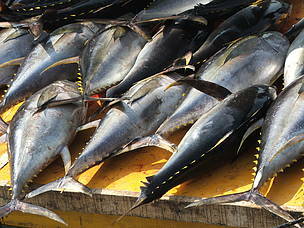 Tuna fisheries also catch a number of non-target species, known as bycatch. Bycatch of highly endangered maarinae turtle and shark species as well as that of juvenile tuna is common in the South Pacific. WWF South Pacifc works to reduce bycatch by changing fishing practices. Promoting fishery certification, namely Marine Stewardship Council (MSC), to ensure that wild fisheries are implementing high standards of management. Raising consumer awareness of oceanic fishery conservation issues and promoting sustainable sourcing by major purchasers. Securing commitments from major retailers to sustainably source their seafood. Increasing the number of environmental NGOs who include oceanic fisheries in their mandate and participate in oceanic fisheries management processes. Engaging civil society organizations and environmental NGOs with oceanic fisheries management issues. Raising awareness of the link between developmental and economic priorities and sustainable fisheries management. The bycatch project aims to support the implementation of fishing best practices to reduce bycatch in Fiji's long line and purse seine tuna fishing industries through the cultivation of strategic working partnerships with the fishing industry and policy advocacy and engagement on bycatch mitigation with the Fiji Department of Fisheries. The focal bycatch species are juvenile big eye and yellowfin tunas in purse seine fishing, as well as turtles and sharks in longline fishing.